For Canadians considering a southern golfing destination, a stretch of Virginia that is the historic cradle to the birth of a new nation, might be the place. The home of the first permanent European settlement in what became the United States possesses a collection of first-class golf facilities to compliment the splendid colonial heritage and southern charm. Golf certainly wasn’t the reason for the first visitors to the area, but recently it has become a focus for many of the thousands of guests who travel to this charming tourist center. With more than 15 championship courses in the area, designed by some of the biggest names in golf architecture, including Trent Jones, Rees Jones, Nickalus, Strantz, Palmer, Dye, Strange, and other notables, this area is a destination golfers dream. The variety of courses, ranging from challenging parkland beauties to links-style beasts will satisfy event the most die-hard golf fanatic. Dating back to the early 1600’s, present day Williamsburg, through to the philanthropic efforts of the Colonial Williamsburg Foundation, provides a window into an infant America. The spectacular visitor and interpretive center gets you started on a rich colonial adventure. The 301 acre Historical Area is filled with a living museum of period characters including George Washington and Thomas Jefferson, restored buildings and vibrant colonial culture. Daily events take the visitor through colonial life, the nation building and foundations of American Independence. This family friendly attraction, with its numerous kids programs, will enlighten and engage anyone interested in discovering the roots of American history. For travellers with a more contemporary sense of adventure a visit to Busch Gardens might hit the spot. This sister park to Tampa’s favourite destination is a fun-filled family adventure. Home to a variety of attractions including the thrilling vertical drop coaster, Griffon, Busch Gardens, will give you a day full of fun and great memories. Water Country USA, the nearby water-park, with more than 15 rides and attractions will be just the right answer to stifle the hot summer’s day. On-line discount purchases can be made for each of these parks or in a package that includes all the attractions at Colonial Williamsburg as well. Meal and accommodation choices are plentiful in Williamsburg. The national chain restaurant favourites give you something you know, but the local specialty restaurants are where you can get the best feel of the tidewater charm. The variety is tremendous and will suit any taste or budget. Those with the shopping bug, The Prime Outlets Mall is as good as it gets. Consistently ranked in the top 10 of outlet malls in the US, the 120 shops will give you hours of browsing and plenty of bargains to take home. The shops adjacent to the historic village will give you hours of browsing and shopping opportunities in an open-air mall setting. With all the historic splendour, charming culture and fantastic golf, Williamsburg is a destination that has something for everyone. Whether you are looking for a round or two to compliment an historical extravaganza or a die-hard week long junket, Williamsburg and golf are a PAR-fect fit. Golden Horseshoe Golf Resort; Located adjacent to the historic area of Williamsburg, this resort’s opulence will captivate and amaze you with its charm. The resort features 5 different choices of accommodation, ranging from a terrific family motel to restored period homes in the historic area, to the luxurious Williamsburg Inn, which has twice hosted the Queen on her visits to the area. The original “Grande Dame” of Williamsburg golf, is home to two championship layouts, a lovely and challenging nine hole course and five-star resort. With a nine hole course having roots dating back to the 1940’s, the resort can boast the longest history to the game in the area. The Golden Horseshoe Golf Club can now boast about having two championship layouts designed by members of the legendary Jones family. The opening of the Gold course, a Robert Trent Jones’ masterpiece, in 1963 saw the introduction of world-class golf to Williamsburg. The resort’s original layout was incorporated into the Spotswood nine-hole gem. Rees Jones’ addition of the Green course in 1991 provided Golden Horseshoe with 45 holes of incredible golf for resort guests and daily fee players alike. Consistently ranked as one of the world’s best golf resorts, this combination of dramatic parkland beauties feature tight, undulating, tree lined fairways with well protected greens. The Green course features an oasis of holes that run through a dense woodland. Tricky greens, with multiple plateaus all well protected by menacing traps and some dramatic water hazards make this layout a real challenge. Longer than its older sister the Gold, this layout rewards the big hitters, but does require a true touch with the approaches to give you any chance to score well. 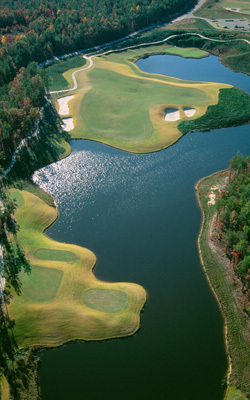 Signature hole 11 is a downhill par 3 that resembles an amphitheatre, guarded in front by a large pond. Eighteen is a tremendous 3 shot par 5. The forced carry over a pond will test your nerves as much as the severely sloped green if par or better is the goal. The Gold course is a design of pure genius. This collection of holes requires finesse, brute force, imagination and control to challenge par. The collection of par 3’s would be difficult to rival for challenge and beauty. Signature hole sixteen is a 168 yard thriller. The tee shot from the elevated hillside, must be struck pure to reach the sprawling island green. The seventeenth, an uphill beast through a chute of trees, provides as tough a par 4 as you will find anywhere. The service here is filled with marvellous southern hospitality giving you a “Member for the day” feeling unlike any other. The charming patio overlooking the dramatic finishing hole surrounded by bird filled ponds and gorgeous fauna, provides you with a perfect place to relax and relive your round on this piece of paradise. 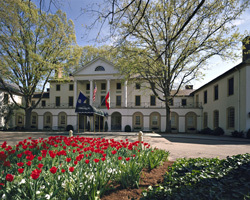 Capped with a night of opulence and pampering at the Williamsburg Inn, you too will feel like royalty. No trip to the area would be complete without playing Golden Horseshoe. The Traditional Clubs; A must on any trip to Williamsburg is to sample the offerings of the Traditional Golf Properties. With 4 courses in the area, The Traditional Golf Trail offers something for golfers of all abilities and interests. Kiskiack: A tree-lined oasis, this layout is filled with numerous elevation changes, forcing you to be controlled off the tee to hit strategic landing areas, and well sculpted green sites requiring accuracy with your approaches. Architect John LaFoy, has created a fun, shot-makers delight. Stretching from 4900 to 6775 yards and sloped from 112 to 134, this layout can challenge both the high and low handicapper. The early holes are where you need to score well as the course gets progressively more challenging. The front nine finishes with a lengthy par 5 with a well protected green followed by a terrific finesse par 4 forcing you to stick your approach tight. Hole 11 is the signature for good reason. A forced carry from a small peninsula tee to an elevated green up to 200 yards away and protected with a menacing facing bunker, requires nerves of steel and a swing that is just as solid. Number eighteen, a classic risk-reward par 5 features a 200 yard forced carry or bail out drive to the right and then uphill all the way home. This full service club provides you with driving range, and the option of power carts. It is very walkable and provides the golfer with attractive vistas presenting a solid test of your skill. Couples and families would be very satisfied with this forgiving, playable and traditional parkland layout. Stonehouse: Since its opening in 1996, Stonehouse has been awarded a vast collection of distinctions from numerous golf publications. This mountain style course, creatively crafted by Mike Strantz who is know for his severe designs, has some of the most dramatic elevation changes you will find without a trip to the mountains. Wide forgiving fairways are balanced with large punishing bunkers and vast strategic green sites well protected by dramatic elevation changes and false fronts. This par 71 jewel, with yardages ranging from 5000 to 7000 and ratings of 121 to 140, will be a stiff test for any golfer. The strength of this course is what is demanded from your iron play. Strike it true and you should find yourself in a good position to score well. Be a bit off-line and you will be faced with treacherous bunker shots or tricky chips to enormous green sites. Holes 15 and 17 are gorgeous par 3’s with greens that can require a few clubs to your decision making because of their size and the pin placements. The finishing hole has a blind tee-shot followed with a mid to long iron to a green protected by a cavern and threatening bunkers all framed by the quaint clubhouse perched overlooking the green. The power cart will be your friend on this layout as more than 10 miles of scenic paths take you around this difficult track. This is a course that will tease you with its strategy and demand every shot you have to score well. Stonehouse will reward you with its beauty while forcing you to think your way around this superb routing. Royal New Kent: Located mid-way between Williamsburg and Richmond, Royal New Kent could be dropped in Scotland or Ireland and not look out of place. 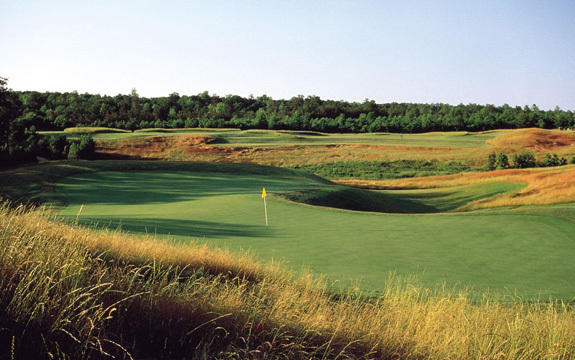 Sand dunes covered in fescue and the dramatic waste areas along fairways make this layout a candidate for the leading role in Beauty and the Beast. Mike Strantz has taken the wooded, red sand landscape and designed a course rated as one of the most difficult in America. From the back tees, New Kent takes the low capper and makes them feel like a 20. Long forced carries, punishing sand traps and numerous hidden greens make this layout feel like running a marathon in quicksand. Everything about this course is BIG. The dunes, greens, bunkers and forced carries are all super-sized making club selection and focus, seem like an after thought. Hole 2 is a horseshoe shaped par 5 that wraps around what looks like an enormous quarry. Based on your tee shot, you are presented with a variety of routes to the green. The par 3’s and par 5’s are an amazing combination of holes. The four finishing holes might be the toughest finale anywhere. Eighteen’s peninsula green is a fitting conclusion to the round and well deserved post round beverage of choice. This visually stunning links layout plays from 5000 to 7350 and has a par of 72 just re-rated to a slope of 156 from the Invicta tees. For those not knowing what colour Invicta is, it isn’t a colour, it is Latin for “In conquerable,” and there couldn’t be a more fitting label. Unless you are a masochist or a +2 capper, give yourself a chance and play a tee deck that will let you enjoy the shot values, beauty and challenge of Royal New Kent and still desire to play golf again. This is an absolute on any trip to the area and will sure put one or two new holes on your personal list of favourites. The Club at Brickshire; Curtis Strange has created a monstrous beast in within a gorgeous community of Brickshire. Located just off I-64 in Providence Forge, this layout features 4 inspiration holes, based on Augusta, Riviera, St. Andrews and Pinehurst. Large sloping fairways and tricky green sites will test all players to the max. Ranked as one of Virginia’s toughest courses, this layout ends with a fantastic finishing hole that is a thrill ride. Williamsburg National: The 2 course facility featuring the Jamestown course, a Jack Nicklaus design, is complimented well by the Tom Clark Yorkton course. Each features gently rolling fairways, large multi-tiered greens and creative routing. Precision is a must off the tee, to provide for greens in regulation. These pleasurable challenges will favour the ball striker over the bomber. Yorkton number 17 is a monsterous par 3 with a green so large the hole could be a 4 club difference based on the pin placement. 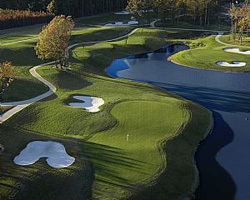 King’s Mill; Many know of Kingsmill as a tour stop for the LPGA and PGA before that, but Kingsmill is also a golfer’s oasis that features 54 holes built by 3 of the biggest names in golf design, Dye, Clark and Palmer. Routed through tidewater and beautiful forests, Kingsmill offers a multitude of choices for a visiting golfer and family. The Bray Woods par-three gem is the perfect place for a family outing, or quick relief of the golf itch. The Plantation and Woods courses are the perfect compliment to the famous River course. The courses present a solid test for golfers of all abilities. Characteristic dramatic green sites propped on plateaus and prominences, force you to be accurate with your approaches or face tough putts. The vistas of the James River are gorgeous. Packages with a stay at Kingsmill’s Resort will provide you with a great golf experience and a vacation get-a-away you won’t soon forget.